Mordian 7th Regiment: Heresy Era Thousand Sons - Tactical Squad Hesyre painting continues! 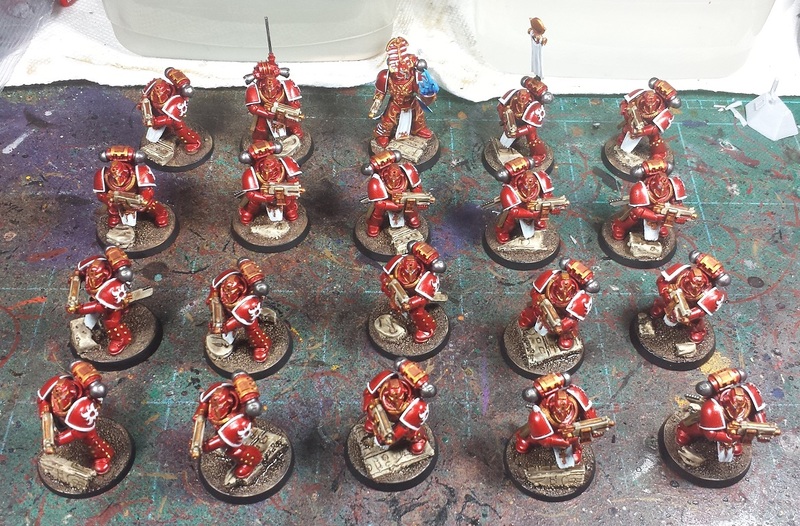 Heresy Era Thousand Sons - Tactical Squad Hesyre painting continues! 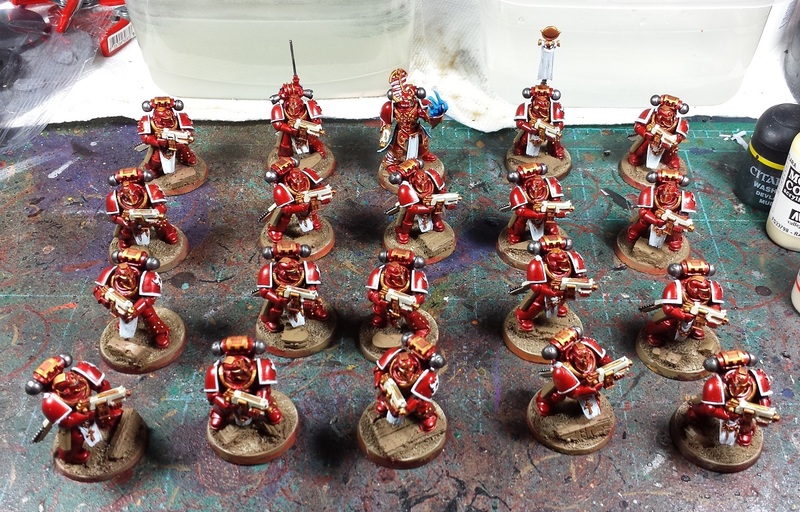 Managed to get a few good hours of brush time in today and made great strides with squad Hesyre! Back in the zone with the batch painting, and some recently-released Eisenhorn audiobooks to keep me distracted - The Eisenhorn/Ravenor trilogies are some of my favorite 40k fiction, and I am really digging the narrated versions so far! Next up for the squad was a bit of steel and blue - The various vents on the backpack, the teeth on the chainswords and so on all got a boltgun metal and dark tone wash, and I picked out the eyes and power cables in the usual electric blue. The blue on the trim of Hesyre's cloak matches the blues that I'd used on Sethep-Khet's robes, but they're a little blown out in this pic. Next up was a whole mess of earthtones. Anything that was going to be leather or bone got a basecoat of Tierra Earth, which also included the bases. I rather like the step when the bases get the first color - It really makes the models pop and it's always a good sign that the finish line is near! Picked out all the bone color on the weapon housings, wanted to try something a little different with the bone and gold weapons this go-around. I think I like it! Next up I switched over to the nasty basing brushes and applied the bone and white to the sandstone parts of the bases, then the bone, the leather, the dirt and the sandstone all got a strong tone wash. Liquid talent to the rescue! Blacked the rims just to clean them up, and at that point they were as done as I could do for the day - they'll be left to dry overnight and I'll re-engage with the final touch-ups and flock tomorrow. Supposed to snow but be gorgeous subsequently so hopefully I'll be able to get 'em sealed in the next few days! 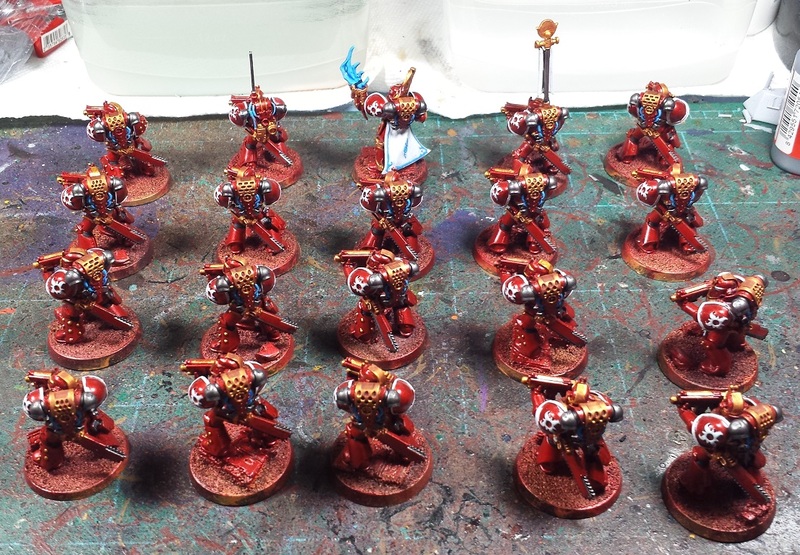 Dont know how manage to get all that painting done but they are looking good, really like the red armour recipe you use. The red is very good and the whole force looks very impressive. I was about to say something along the lines of "Good Grief, don't you ever sleep ?" but then remembered that 0900 here is 0200 where you are. When i read the 'supposed to be snow' bit for a second I thought 'That's unusual for Prospero.' before I realised you were talking about the weather. @Vitor: Little bit of brush time every day if I can, suddenly they're all done at once! Looking good, did you see the forgeowrld mailer about the impending release of the 1k sons dreadnought? Psychic dreads, yes please! They look sooooooo good. Really love the rich red and gold! Looking well so far, nice solid unit. @Bronislaw Czevak: Indeed! Can't wait to get an Osiron, and a maniple or two of those lovely Achean Castellax! @Col. Hertford: Thanks man! It's been a bit of an experiment but I'm liking how they're coming out in the end! @Rory Priest: Cheers bud! Not the sexiest unit ever, but you gotta have some basic troops choices to hold those objectives! 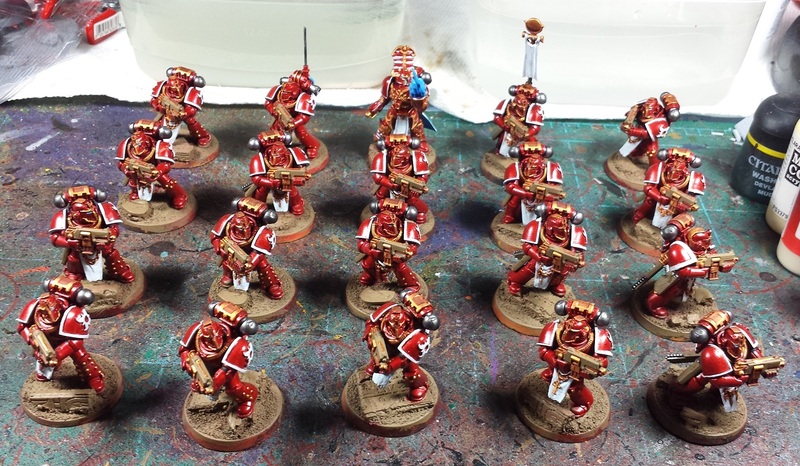 Impressive to follow your batch painting madness. "Eisenhorn/Ravenor trilogies are some of my favorite 40k fiction" - Original Space Marine novel aside, mine too. The character Eisenhorn is written with so much depth and the fact that he isn't some super-powered combat monster makes him a bit more tangible to me. @Dai: Indeed! Just got through Malleus and started Hereticus, Toby Longworth is killing it with his narration. Audiobooks while painting for the win!